Living in relative peace and quiet with his family, Hershel Greene welcomed Rick's group onto his farm, but tragedy struck when a barn full of walkers he had captured got loose. He and his remaining kin later joined Rick at the prison. 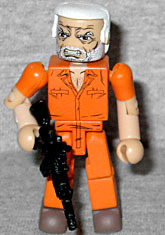 This figure depicts Hershel after he'd run out of clean clothes and had to resort to wearing one of the jumpsuits from the prison. It's a rather boring figure (Colt M4A1 Carbine aside), but it does provide a nice, plain body for displays. We've already got cops, so here's a robber! His shirt is open slightly, because the series takes place in the south, and he looks very angry, because he's an old man forced to change his ways. 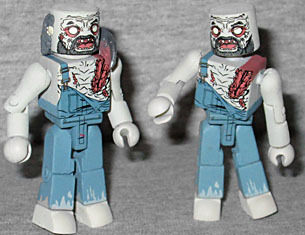 Every zombie Minimate is supposed to be based on a specific one from the comics, but I can't figure out what the "Farmer Zombie" is meant to be. The closest I could find was the one in the convenience store in issue #49, but it's not really that close: like this Minimate, it was bald on top but had stringy hair and a beard, and was wearing overalls, but that's where the similarities end. The toy isn't painted with a shirt on, just a decaying chest, and it has a sickle buried in its shoulder that the comic was lacking as well. It's a neat piece - it's attached to his hair, which is done as a ring that fits over the neck below the head - but it definitely means that this zombie wasn't in the comic. And yet if you want the variant, you end up with two of it. 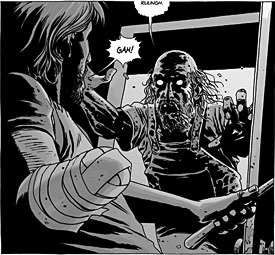 A former football player, Tyreese joined Rick's group with his daughter early on. He was instrumental in helping rid the prison of walkers, and he would do whatever was necessary to keep his fellow survivors safe. 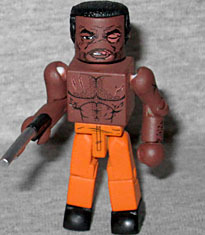 Sure, this is "Battle Damaged" Tyreese; let's just say that Minimates' modular construction is going to come in handy for this one, eh? And I don't just mean because mine was misassembled in the package, with the torso and head on backwards, but the arms facing forward; nothing to lose your head over. This figure of Tyreese is stripped down to the waist, and has been beat all to hell: one eye is swollen shut, his lip is bruised, and there are cuts and contusions all over her chest. He comes with a shotgun, but it obviously didn't help him at all in this fight.